She’s tested the parachute four times, ripping the cord between her breasts, on each trial jumping from a greater elevation, first ten feet, then twenty, forty, fifty. The device works, no doubt about it; she hasn’t felt the slightest impediment as the glossy umbrella distends above her head and floats her to safety. But each time her hand fumbles for the cord, she imagines soldiers leaping from flaming planes, their chutes collapsed like exhausted lungs as they inhale for the last time the eternal stench of war and life, and she remembers the uncle she had never seen, plummeting into extinction over the mountains of Vietnam. “It makes me think of war,” she admits to Andy, the stunt coordinator who routinely designs and stages battles on land, sea and air, instructing novices like her in parachute jumps for film. The helicopter is lifting straight up, and she has the strangest temptation to cross herself. “Oh, God,” she whispers. “Forget God. Gravity’s gonna help you, not God. Just remember to pull the cord.” And with the full weight of his shoulder, he presses open the door. In an instant she’s standing an inch away from sky, gusts of air assailing her. None of her experiments on land have prepared her for this open door into nothingness, into a funereal sky enlivened by only a few struggling stars. Wedging her hands against the frame, she tries to get her balance but the helicopter too is unsteadied by the winds and its oscillation makes her giddy. Below, the lake looks like a pond, an opalescent puddle surrounded by rocks. It seems impossible that the parachute will deposit her within its small mouth. Not that it matters where she lands: the cameras, one behind her in the helicopter, the other at lakeside, care only for the spectacle of her jump, the suspense before the parachute expands above her, and the protracted, picturesque whorl of her mid-air dance. They could leave her hanging there forever, in permanent transition between sky and earth, while they roll away to set up the final shot: the depleted parachute snagged on a rock bordering the water, its membrane of skin artistically torn by the designers, no body in sight. Poised in the open door, she mentally aims for the lake’s heart, and when the signal comes, hurls herself toward it. Hovering in space, feeling cold currents assault her, she entrusts herself neither to God nor gravity but to the etymology that is supposed to insure her safety—from the Italian parare, which means to protect, and the Frenchchute for fall—and yanks the cord. For an instant nothing happens, and she hurtles down to meet her uncle’s skeletal face—and then, magically, the parachute billows open, a fantastic mushroom, and she is saved again. Within minutes, though, she finds that the winds are fighting her; the nylon catches in a current, and she has to strain with all her might toward that tiny crucible of water below. There’s a chance she won’t succeed and be swept away into . . . ? But it’s inevitable; she’s coming down. Wafting closer to the ground, she notices on the bank, not far from the bustling crew, an old man in a wheelchair, his lap hidden under a plaid blanket and his gnarled face lifted to the sky. Borne past him, she has only a glimpse of his huge, knotted hands gripping the armrests of his chair before she scuds upstream, her behind like a little spoon skimming the lake’s surface. The parachute drops her on a defoliated knoll some distance away. Picking herself up, disengaging what is now an encumbrance and dragging it behind, she walks toward the cluster of crew and company, and as she does so hears the director announcing through his megaphone that they can wrap the scene. A surprising loneliness falls upon her, making her think of empty rooms and silence. A young woman from the design crew takes the parachute from her and rips it methodically with a knife, then drapes it across a boulder so that a tusk of rock pokes through the slit like a Roman nose. Later, cameras will close in on this arrangement which suggests, without defining, some unspeakable disaster. But now the old man is waving excitedly to her, and she draws near. His neck that twists toward her is as knotted as his hands. “You forgot to get loose of the chute, girlie. Good thing it didn’t fall into the water; would’ve filled up fast and pulled you down under. Gotta be careful, gotta be careful, gotta be careful. Can’t say it enough,” he exclaims, banging the side of his wheelchair with his enormous hand. Everyone knows his story: Petey Pontelle, ex-stuntman, whose twenty-two years in the business were extinguished in a breath when his speeding car zigged instead of zagged, and in the headlong collision with a highway stanchion, paralyzed his body from the waist down. Although he had collected hundreds of thousands of dollars in insurance money and had wheeled himself into the future, opening a liquor store in Orange County and becoming expert in the merits of this beer and that scotch, he continued to yearn for the intoxications of speed, high falls, wing-walking on swooping planes. In order to enjoy, even from a distance, those lost pleasures, he calls the Mayor’s office each week to learn if any action films are being shot in the vicinity. When one is, he arrives at the location—neither inclement weather nor inconvenient hour deflects him—and sets himself up on the sidelines. No director refuses him this diversion. Seated there in his incapacity, he watches every stunt as if his life depends on it, and with unblinking eyes, from which his obsession peers out like a jealous woman searching the night for her lover, rehearses the hours of his fulfillment. Long after everyone has gone, Jo sits on a rock, her knees hugged against her chest, contemplating the crystalline waters and sky. No evidence of her stunt remains except on a reel of celluloid packed inside an oversized can. And although she knows that even that fragile record can be consigned to trash on the cutting room floor, and that she too can be doomed to invalidism and nostalgia, like Petey Pontelle, she feels only a slight pang, a vague uneasiness. Her natural affinity is not with the stuntman but with the single star winking in the darkness like a mischievous eye, its reflection dancing on the water. Overhead a flock of wild geese abandon themselves to the night sky, their hoarse cries like the shrieks of children at play. She watches them wheeling over the lake’s mirror, and suddenly she is back with her father tossing her up in the air again and again and again, feeling the thrill of floating in space, supported by nothing but air, the radical plunge into water with its moment of total and intense fear, and then again, the air, the light shining down on her, the radiance of her father’s face looking into her own . . .
“You could have been a championship swimmer or diver,” she hears him saying even now. Didn’t he know there’s no such thing as false pride at seventeen? You’re a wound that opens with every failing. You suffer because your friend has her arm around someone else. You don’t sleep because there was an empty seat next to you in the lunchroom and no one sat in it. You agonize over the pimple on your chin and your eyebrows that are too straight and your body that doesn’t curve where it should. You stumble when you go to the blackboard and hear the laughter of multitudes. You believe that you’re ugly and everyone else is beautiful. You believe that you’re beautiful and no one can recognize it. You loathe your mother and father and would die for their blessing . . .
It’s true. On the diving board, springing, my body sleek as a cat’s stretching upward, supple as a cat-of-nine-tails in a breeze, lifting off, on point, one knee raised, the other taut—but at the last moment, the instant before flight, I turned my head toward my parents, my eyes seeking theirs, and destroyed everything—my focus, my line, my balance. My right shoulder entered the water a split second before the left, and my victory went askew with my form. Penalty. One frame out of whack, four points gone. I didn’t qualify. I had turned. Losing herself in books through the long hours of the next years, the hours when she might have been practicing or competing, she had understood that Lot’s wife had more cause, Eurydice had the purer temptation, while she, she had . . . what? A fatal insecurity that craved reassurance, a hunger to see herself reflected in her parents’ eyes, reflected and confirmed—as if the water weren’t mirror enough!!! And now she’s a mirror herself, a reflection, a shadow: a double. Nameless and faceless, she intercepts the dangers, even the death, meant for another. Some days she feels like a martyr, a female Sydney Carton laying her head on the block in a passion of altruism and revolutionary zeal; on others she sees herself as a kid playing with guns or a mercenary willing to risk everything for a few dollars and a neon glory. What am I, what am I, she grills herself, unable to get the picture clear. Am I smart or stupid, courageous or foolhardy? Closer to Mother Theresa, breathing the corrupted perfume of lepers, or to Mickey Mouse, braving a hurtling train to save poor Minnie lashed to the tracks? In short, what are you, the mirror asks relentlessly—a heroine or a cartoon? 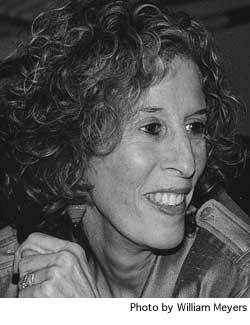 Susan Yankowitz is a playwright, novelist, and librettist. Among her plays are Phaedra in Delirium (winner, QRL poetic play competition); Terminal and 1969Terminal1996, collaborations with Joseph Chaikin's Open Theatre (Drama Desk Award); A Knife in the Heart; Foreign Bodies (finalist, O’Neill Conference 2008) and Night Sky, produced throughout the U.S. and internationally. Her monologue about Mukhtaran Mai was produced as part of Seven in 2008. Cheri was a finalist for the 2006 Richard Rodgers Award, and she is the author of the novel, Silent Witness. View More: Next piece "The Writing Life: A Conversation", Home, Archive.